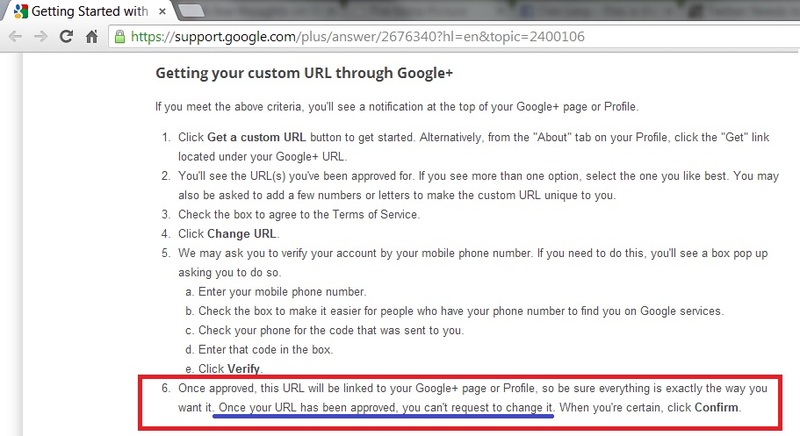 A few weeks back it was announced that Google+ was finally going to allow regular users to adopt Vanity URLs for their profiles and rid themselves of URLs like https://plus.google.com/105175761337711150993/posts (yes, that’s my real Google+ URL). Sounds great, right? Finally the common folk would be given on Google+ what most other modern social networks had from the outset, the ability to pick our own screen names and have a URL to link to which isn’t ridiculously unwieldy and next to impossible to remember. I was feeling a bit pessimistic when I read that but friends who are way bigger Google+ users assured me, “You can request a different one if you have a valid reason” and “There is flexibility… You just have to request it…” so I decided to see what Google did when they finally got around to offering me a custom URL. Well, today that finally happened! Post A Day 2011 Is Over…Now What? Should I continue to post every day? Let’s be perfectly honest here, there were days when I wrote completely garbage posts. There were days when I straight up said I have nothing to write but posted anyway because I was doing a challenge which required posting daily. Shouldn’t I be trying to separate the wheat from the chaff now that I am not doing a regimented post per day kind of thing? It is one heck of a lot of work and sometimes I found it got in the way of other things because I ‘had to post’ each day. I’ve gotten into a good habit of posting every day and why should I stop now? Look it’s 11:46pm and I am still typing away right now doing my post for today. Often topics and posts that I thought were incredibly inane and which I just wrote because it was 11:30pm and I needed something to write about really struck a chord with people. Case in point, my signature scent vs scent switching cologne/perfume post, I truly did not think that that post would resonate with anyone and it was just something to write about with time a-wasting before the midnight deadline. If I wasn’t tryign to write a post every day would I have written about the cologne? I’d love to say I would have eventually gotten around to it but I can’t say that and be perfectly honest. Basically, what I think to be throwaway writing isn’t necessarily that. So here’s what I’m thinking, I will continue to write a post a day so long as it isn’t a post about how I can’t think of anything to write that day. What do you folks, my readers, the most important people in this relationship think? Good decision? I am open to suggestions and really would like to hear your thoughts, pop em down below in the comments. Hooray! Is that the reaction I should have? As most of you already know (and can see in the sidebar of this blog) my Twitter account is @TheDanLevy and it seems someone has taken the time to make the above account “@realDanLevy.” As you can see by the above screen shot the person who has chosen to impersonate me on Twitter with the aforementioned account has stolen my Twitter profile picture, directs people to the same personal URL as I do and claims in their bio that “I’m the real Dan Levy.” What you can also see is that they have been mirroring my tweets since the account was created (according to TweetDeck) Sun 25 Dec 2011 at 22:03. How are they mirroring my tweets? They are using a service called TwitterFeed which probably picks up the RSS feed of someone’s Twitter account and rebroadcasts it elsewhere, in this case to the impersonator’s Twitter account. As you all know this whole year I have been involved in the WordPress Post-A-Day 2011 Challenge. This has been a huge learning experience for me, not only in the difficulty that comes with creating content that is interesting – at least to some degree – and well written on a daily basis. Beyond the challenge that is associated with completing this endeavor as long as I have and continuing on there is also a lot of good and interesting conversations that have come out of it. One such conversation happened last night. A friend of mine contacted me via Facebook and asked me about the challenge. She was wondering whether or not she should start blogging daily as well. I honestly had no answer to give her. I explained to her that j found the task a very challenging one while also being very fun and rewarding. She then opined that if she wrote about het life in a blog it would be really messed up for people reading it because her life is filled with so many trials and hardships and weirdness. I told her that just because she is choosing to blog daily doesn’t mean that you necessarily must write a lifeblog and explain to everyone everything that is going on I’m their own her life but it is her decision to make at the end of the day. Hey there folks. Remember how I wrote The Dan Levy FAQ last month? Remember how part of it was all about how I have no relation to Eugene Levy and his son Dan Levy the former host of The Hills Aftershow on MTV? Well the reason for that is that when people meet me they more often than not seem to think that they are the first people who ever realized that I share the same name as that guy. The show ‘The Hills’ was on from May 2006 to July 2010 – somehow that’s 6 seasons – (thanks Wikipedia), I don’t know how long Dan Levy hosted The Aftershow but it was a while – I AM WELL AWARE OF HIS EXISTENCE AND THAT WE SHARE A NAME! 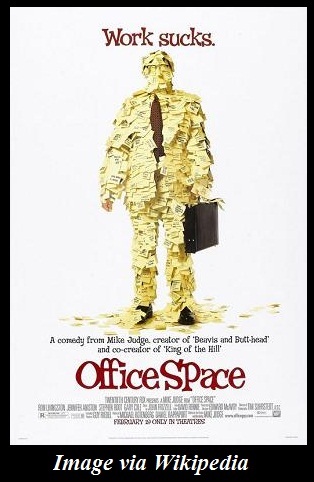 Have you seen the movie Office Space and how annoyed the character Michael Bolton is when the mail lady asks him about the pop singer Michael Bolton (whose music the non-famous Michael Bolton actually despises)? I have the scene linked below as the office worker Michael Bolton explains to his friend Samir why he hates Michael Bolton the singer (this is not how I feel about the other Dan Levys, my namelgängers). PS I totally wanted to include the scene with Michael Bolton and The Bobs because it is way funnier in my opinion. Alas, I couldn’t because I couldn’t find it on YouTube. (Found plenty of pretty bad re-enactments though). Guess what folks, that is what almost everyone in the world feels like when you make some comparison like that to someone famous or a reference to a famous song or character the first time you meet them. For all you middle aged people or fans of Elton John/1970’s music I know there is a song by Elton John called “Daniel” which was released in 1973 and was a huge hit. I know the chorus says something about “Daniel my brother”. I don’t like the song, but I have known about it for about 20 years since a grade school librarian made the comparison when he met me after meeting my 2 older brothers. I am sure there are a bunch of people out there who are named Jack Bauer who are sick and tired of hearing about CTU and how when they are having a crappy day it “must be the longest day of their life”. You may think you are being hilarious with your joking comparison but I promise you they stopped finding it funny years ago and are gritting their teeth to keep from punching you. 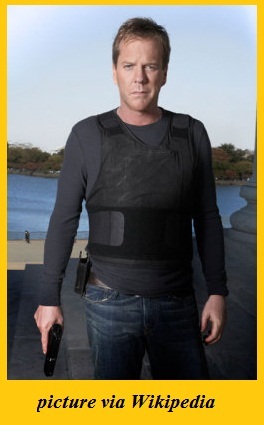 In fact, the comparison to the hero of 24’s character may actually bring them to start feeling like 24’s Jack Bauer looks like he feels in the picture to the left…FED UP. I have a friend named Jeremy, he is a HUGE Pearl Jam fan, the first time I met him I didn’t start singing the song by Pearl Jam called Jeremy. Even if he wasn’t a huge Pearl Jam fan it isn’t as if he spent that past 20 years living under a rock and no one has ever made mention of that song to him. If you are from a country where there is a huge hit song/personality/TV show and you meet someone with the same name then OK, fine! Make the comparison – that’s somewhat different. But I beg of you as a matter of etiquette, if the comparison is something renowned in the country you’re from (or in) don’t make the reference because those people have already heard it 800 times. You are not being funny or original. I don’t need to hear about “When the Lee-vee Breaks” (an attempt at a comparison to the Led Zeppelin song “When the Levee Breaks”) or how when I am on my way out the door I am ‘Lee-vee-ing’. That was mildly amusing the first time someone said it when I was 8. Look, at the end of the day I am not perfectly innocent of this either. I have definitely done it before because I think it is something we all do. I wouldn’t be surprised if it is a natural reaction in the attempt to remember a person’s name who you just met. (#ProTip: They say you should repeatedly use the name of a person you just met in conversation with them to better remember their name later.) But please, for all of our sakes think about it before you say it because the joke/comparison has probably been made and you are not doing anything to endear yourself to this new acquaintance. 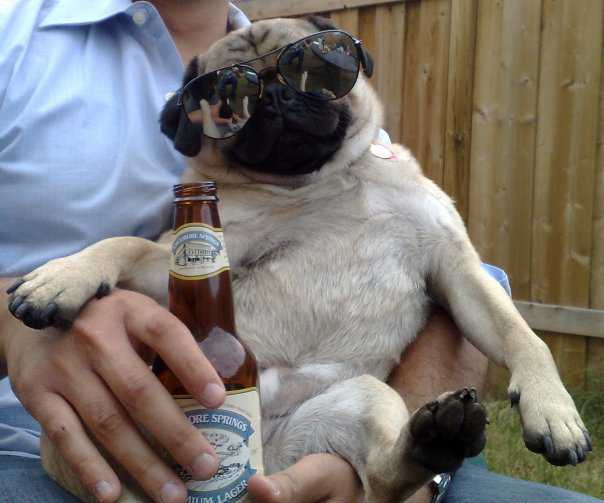 My friends' dog, Pete the Pug chilling in the backyard drinking a brew and wearing shades because it's so sunny out. Dogs. As I said in the post title, I love them. I have seen friends and just random people with their dogs and how much they love them and enjoy playing with them and I agree that pets in general are awesome to have. 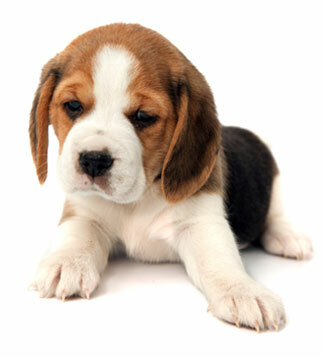 However, also as I said above, I don’t think I could ever own a dog. Why? you ask. Well the answer is pretty basic and simple and to some very amusing: cleaning up after them when they go on a walk. Ya, using a plastic bag to do the clean up after a dog does what it needs to do is what prevents me from wanting to get one. You may be laughing about this and you may agree with me. You may be saying, “Well, just get a Pooper Scooper and then you’re good to go!” Well who’s going to clean up that Popper Scooper? You? I certainly don’t want to! I have theories as to why I am so not into the idea of it and one of them has largely to do with as a kid never having a pet like a dog where one has to deal with cleaning up after it or cleaning its cage (for smaller animals). I think because I never got acclimated to the idea of it in my younger years is what prevents me from wanting to even consider doing it now. Some people have asked me, “OK, well what about when/if you have kids? You’ll have to deal with diapers and changing them!” Well, I have considered that and I don’t think I’ll have an issue with it…don’t ask me to explain why because I can’t. Of course, this isn’t a categorical refusal to ever do it or own a dog because of this. Lots of things I thought I’d never do or never want to do I have done and do want to do now so people can change their mentality. This is just my feeling right now. I do have a couple of solutions to my problem, one that I have come up with on my own and one that someone told me about recently. I get a farm or live somewhere with a huge backyard where I can let my dog roam free in a section of it. It can do its business in this section and I never have to worry about dealing with the cleanup. A gardener or landscaper might even do it for me which leads me to option two. I hire someone to walk my dog or cleanup after it in that area. There are apparently people who do this I found out, much to my surprise, recently. I could totally do that. 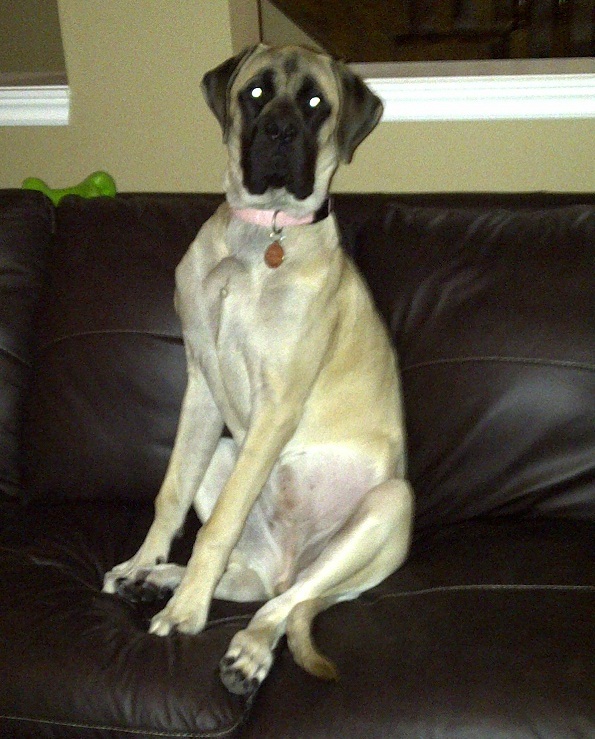 Penny the not even a year old mastiff, isn't she adorable...and huge! However, even these 2 options I don’t think are very good solutions. A dog, in my mind, is a responsibility. As well, judging it from the outside perspective, I am fairly certain that part of the bond built with the dog is taking care of it. Not the actual cleaning aspect but being the one who takes care of it and takes it out for walks. I think that is a huge part of the relationship building between owner(s) and dogs and wouldn’t want to not have a full relationship with my dog if I had one. Lots of dogs are cute and very lovable I agree but this is one aspect I don’t know that I can really get over. Maybe someday I will. Readers: Anyone with me on this? Anyone who ever thought the same as me and now has changed their tune? Let me know! As you can see in the picture above I returned a little while ago, OK a month and a half ago, to Mickey’s Pizza in Mississauga (feedyourdragon.com, on Facebook Facebook.com/MickeysPizza, and on Twitter @FeedYourDragon). I went because since the last time I’d been there my dragon had been doing some serious growling and needed some feeding! There were other reasons I went, one of them being to introduce Nus aka @MichaelNus, Chris aka @CBrooker, and Krista (who is not on Twitter and as far as I know doesn’t have a website/blog…yes I actually do hang out with people who don’t have an online presence) to Mickey’s Pizza and the wonderful couple who run it. So we got out passports stamped on the QEW out of Toronto to Mississauga (I kid, I kid) and we were on our way to feed our hungry dragons. When we got there I looked on the wall and lo and behold! Mickey’s Pizza had a quote and photo from my earlier blog post up on their wall!!!! On to the experience – delicious as it was last time and also uber-reasonably priced! It turned out that Mickey’s Pizza had a sweet deal going on that eve (and still has awesome deal every now and again via Facebook and Twitter). We ended up getting very, very well fed for under $30 so I advise you to always check their Twitter or Facebook pages before heading over to Mickey’s! I’ll fill in all the proper links later but That was the experience in a nutshell. Talk to all y’all soon! Thanks Mickey’s! Update: As I mentioned in the previous post WordPress for BlackBerry was giving me serious, serious issues posting this last night. I was nowhere near a computer and finally had to make an entirely new post, copy the text from the old post and paste it into the new one and have it publish but by then it was 12:08am on March 30th. I consider this post created on the 29th as it really was…the problem was I couldn’t post it. As such, I have adjusted the posted on date to reflect when this post was actually completed (this update and note notwithstanding).